Large Squared Square Tool Calling all embroidery people. 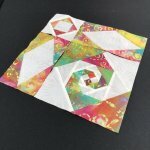 This is the technique for you to showcase your embroidered blocks without having to use paper foundation piecing. However, stacked squares is for everybody. You can create depth in your quilt tops as well as secondary patterns. This is not a class but a work day to finish your BeColourful UFO's with Megan's help. Rapid Fire Hunter's Star - Petite Take another look at the traditional Hunter's Star. Not only does Deb Tucker make it an easy block to create, but look at how this block plays with some of the other units. Let your imagination run wild and combine some of your previous techniques with the Rapid Fire Hunter's Star blocks. studio 180 Tucker Trimmer & Magic Wand Don't underestimate the power of a half square triangle or combination units. Learn to make these versatile units accurately and quickly because they are found within many quilt tops. You will be amazed with the improvements you will experience in your piecing when you use Deb Tucker's methods and tools. technique class - learn 6 different ways to apply bindings! Love those sharp points? Learn to paper piece, it's fun and addictive! 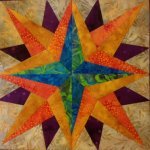 This class is for the beginner who has never paper pieced or someone who is not sure if they are doing it right and struggling.